Last time we stretched the intensities of a specific range of values. The method for determining the bounds was somewhat arbitrary and we simply spread the intensities equally. Stretching uses more of the intensity spectrum and, hence, increases contrast, but it may not be the best approach to preserve information. Could we be a little more intelligent about how we distribute the intensities? In an image with perfect, uniformly distributed intensities, the probability of any intensity would be the same as the probability of any other intensity. This generally isn’t possible on a per intensity basis, however, if we consider ranges of intensities, we can get close. 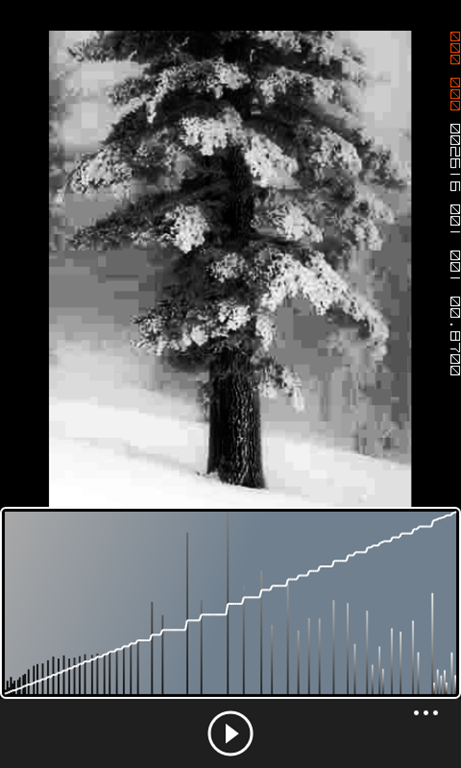 For instance, a random pixel in a high contrast image would have roughly the same probability of being in the light or dark ranges of intensities. This is achievable through, what I like to call, mathemagic. When we roll a die we have six possibilities: 1,2,3,4,5, or 6. What are the odds that 1 will come up? 1 in 6 right? In this case our probability is P(1)= .1667. What about 2? P(2)=.1667 as well, right? What is the probability of 1 or 2 coming up? P(1 or 2) = P(1) + P(2) = .3333. Note that the chances of any side coming up = P(1)+P(2)+P(3)+P(4)+P(5)+P(6)=1. Back to our situation, what is the probability of a randomly selected pixel having a specific intensity? 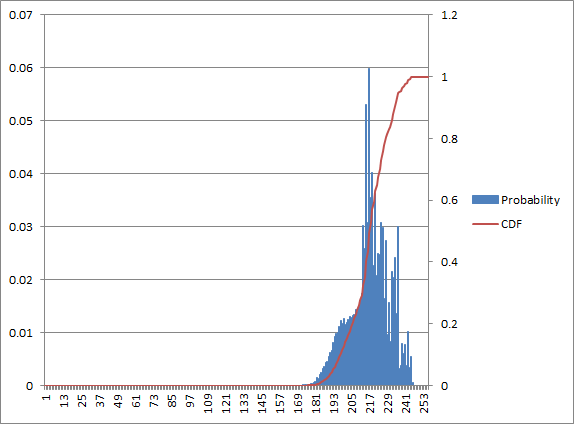 Using the histogram, this is trivial to calculate. Simply take the total number of pixels at the intensity divided by the total number of pixels. Okay, so what? This is where things get a little tricky. 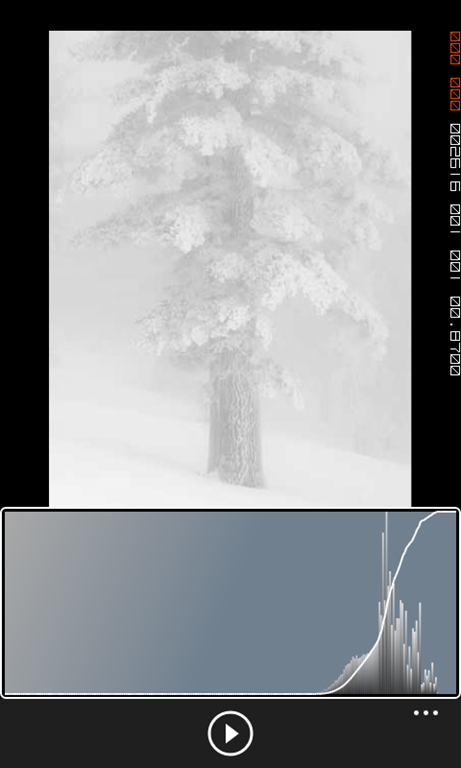 If you were to divide every value in a histogram by the number of pixels you would end up with the probability for every intensity. 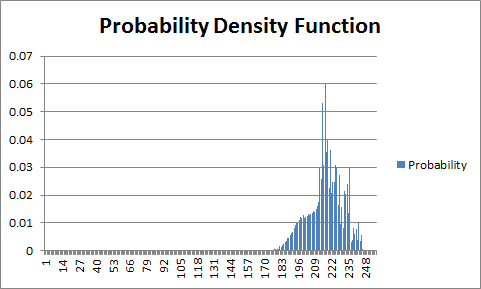 This is a discrete probability density function (PDF). If we have a given intensity k, what is the probability that a pixel will have an intensity between 0 and k? I hope it is fairly apparent that P(intensity≤k)=P(0)+P(1)+…+P(k). In our case, the possible intensities range from 0 to 255. So, for 0≤k≤255 the CDF(k) = P(intensity≤k). Why does this matter? Well, if we map the current intensities to the CDF, it will evenly distribute our intensities across the spectrum which is exactly what we want. Notice how the CDF is now a straight line? This means that we have done a pretty good job of distributing the intensities. If we were to run this procedure again it would not change. While these results are similar to our contrast stretched tree notice how the spacing is not equal. In fact higher occurring intensities are spaced further apart than lower occurring intensities. The math involved here is a little more intense than the other image enhancement techniques we performed. This is one procedure that I did not find well explained on the internet. If you have any difficulties understanding it get in touch with me @azzlsoft on Twitter or rich@azzlsoft.com. However I would like to know about the licensing issues in using this in my Windows Phone app. Can I use this in my non-commercial(free) app?